5/4 Cup of Coffee: It was a clean sweep for the affiliates on Wednesday, as they used a combination of the long ball and stellar pitching performances. Aneury Tavarez's (pictured) two home runs highlighted Pawtucket's victory, while Josh Ockimey and Michael Chavis did most of the damage for Salem. Travis Lakins and Darwinzon Hernandez continued to pitch well, while Henry Owens was wild but effective. A 15 mph wind blowing out to right field benefited the PawSox as they clubbed four home runs to down the Chiefs. Aneury Tavarez extended his hitting streak to nine games as he went 3 for 4 with two home runs and a walk. The home runs were his first since opening day, and he is now 5 for 8 in his first two games with the PawSox. 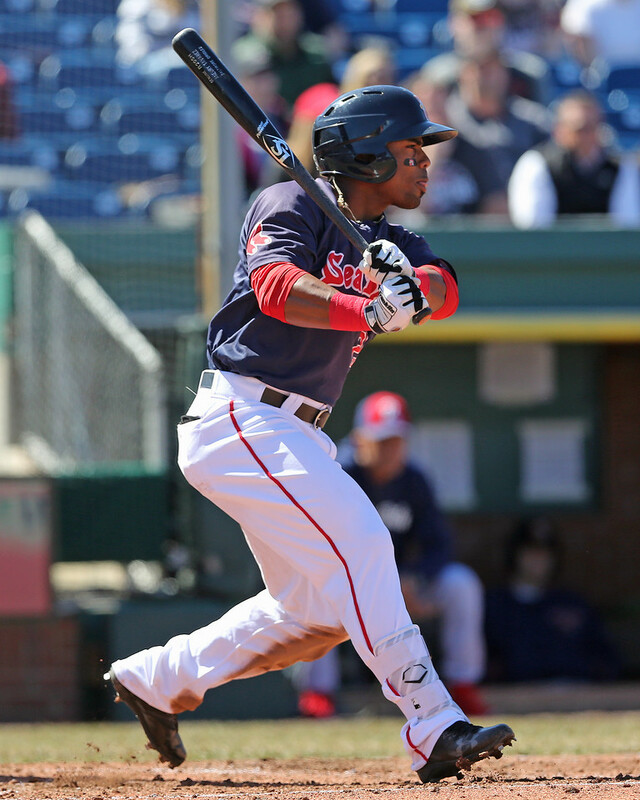 Rusney Castillo slugged a double and a home run in four at-bats, and Steve Selsky added a two-run shot. Sam Travis went 2 for 4, and he is now 11 for his last 32 as he shakes off his slow start. Henry Owens gave up only one hit over five innings while striking out seven, but he also walked six as he continues to battle his control. He now has 18 walks in 26 2/3 innings this season. Robbie Ross Jr. made his first start appearance since being optioned to Pawtucket, striking out one in a scoreless ninth. The Sea Dogs finished off a sweep of the Yard Goats behind a solid start from Kevin McAvoy. McAvoy allowed one run on five hits over six innings, walking one and striking out six. Luis Ysla and Jamie Callahan were lights out in relief, with Ysla striking out two over two hitless innings, while Callahan struck out one in his only inning of work as he lowered his ERA to 0.90. Callahan has yet to walk a batter over his 10 innings this year while racking up 16 strikeouts. Tzu-Wei Lin remained scorching hot, going 2 for 3 with two doubles, and Rafael Devers went 1 for 3 with a walk. An RBI double in the top of the eighth from Michael Chavis proved to be the difference as Salem squeaked out the win. Josh Ockimey got the scoring started with a three-run home run in the first, his fourth of the year and first since April 21. Travis Lakins went the first five innings, allowing one run on five hits while striking out three. The three strikeouts are the fewest he has had in a game this season. Adam Lau earned his first save with two shutout innings. A grand slam from Roldani Baldwin broke the game open in the eighth as the Drive cruised to victory. Ryan Scott added a two-run double, and Bobby Dalbec went 2 for 4 with an RBI. The two hits broke an 0-for-19 slump for Dalbec who saw his average drop from .303 to .235 in that time. Darwinzon Hernandez improved to 2-1 on the season with 5 2/3 innings of shutout ball. He allowed three hits and walked three while striking out six. Stephen Nogosek pitched a scoreless ninth and he has now had six straight scoreless appearances. Player of the Night: It has not taken long for Aneury Tavarez to make himself comfortable in Pawtucket, as he was on base four times and hit two home runs in the PawSox victory. Tavarez played in six games for Pawtucket in 2015 and five games in 2016, but this stint figures to be longer than those. Tavarez is now battling with Steve Selsky to be the first outfielder called up if there is an injury in Boston.